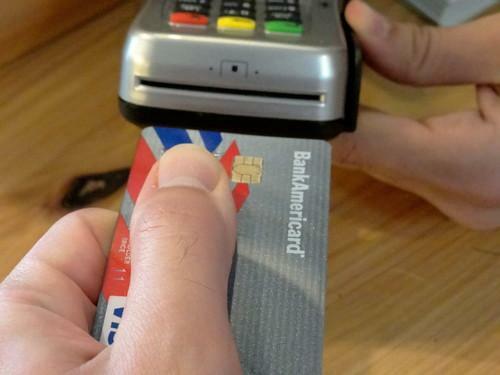 A chip-enabled credit card, inserted into a store's reader. Chip-and-PIN payment cards have a strong supporter in the hotbed of payment technologies, with San Francisco's district attorney promoting the new technology as a way to cut down on fraud. As nearby tech startups like Square and giants like Apple and Google invent new ways to buy things, San Francisco DA George Gascon is pushing for stores to accept chip-and-PIN, an updated version of the tried-and-true credit card. "We're still using old technology that's very easily skimmed," said Gascon, referring to malicious software and devices used by fraudsters to collect people's card information and duplicate their cards. That's why chip-and-PIN card technology is needed to thwart payment card theft, he said. The chip in the cards creates a one-time code for each transaction, making it harder for criminals to create a fraudulent card that's of any use. In combination with other improvements such as point-to-point encryption, chip-and-PIN may help to prevent thefts of payment data like the large-scale attack at Target last year. With chip-and-PIN, customers insert the card into a slot in the store's reader instead of swiping the magnetic strip through the machine. "This will provide tremendous protection for consumers," Gascon said Tuesday at a local bookstore in San Francisco. He was kicking off a campaign to build awareness around chip-and-PIN (also known as EMV for EuroPay, MasterCard and Visa) and get more merchants to accept the cards. Gascon hopes to translate growing awareness of EMV into action by consumers, businesses and banks. He's no stranger to issues of crime and tech, having also pushed for a kill switch in smartphones to curb theft. EMV is already commonly used in Europe, but it's been slow to catch on in the U.S. That may soon change, as American stores face a looming deadline to install readers for the cards. Come October of 2015, businesses that don't accept chip-and-PIN cards could be held liable for card fraud, something that the cardholder's bank normally takes care of. Gascon's campaign is aimed at helping more merchants nationwide, but particularly in San Francisco, get on board. "We're trying to move ahead of this," he said on Tuesday, during an event at Green Apple Books. The store started accepting chip cards in August, and roughly 10 percent of shoppers use them, workers there said on Tuesday. American Express, Discover, MasterCard and Visa have all announced plans to move to EMV in the U.S.
More businesses need the right terminals to work with the cards, but hardware isn't the only issue. About 30 percent of businesses already have terminals but may need to update their software, said Stephanie Ericksen, VP of global risk products at Visa. By the end of next year, roughly half of all merchants will have updated their terminals and half of all cards will have chips, she estimated. The federal government is also getting into the act, with President Obama recently ordering chips be placed in government payment cards.